“To reach a specific diagnosis for my husband, Jorge, took a long time. When eventually they found it was untreatable lung cancer, and told us he would need to begin palliative chemotherapy, I went home and cried. Jorge said that he didn’t want me to cry, but to be strong for both of us and concentrate on getting through the time we had left together. After his diagnosis Jorge had one lot of chemotherapy and wasn’t well afterwards so was admitted to Torbay Hospital. While there, Rowcroft’s Community Nurse Specialist, Louise, came to see him and once Jorge returned home she visited us regularly. 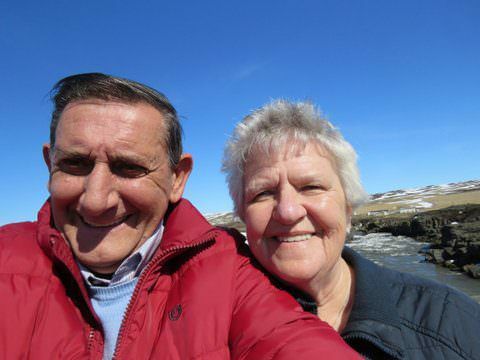 Louise was somebody who had all the expertise we could need, but who was also a good listener; she liaised with the doctor’s surgery on our behalf, helped to relieve Jorge’s pain and nausea and put us in touch with other hospice services. An Occupational Therapist (OT) from Rowcroft gave us a wheelchair to use, which was fantastic. The OT showed me how to use the chair, showed me how to dismantle it and put it together, and then made me do it so she knew I was happy. We also had Complementary Therapy at home. Jorge had a back massage and reflexology; I also had reflexology and an Indian Head Massage. It was really, really lovely – in fact I fell asleep! All the care we had at home was exemplary and Louise took the pressure off. I was able to talk to her; if she could see me getting upset she’d take me into another room so we could have a chat. She also spoke to Jorge about what he wanted to happen when the time came and he said, though he had no experience of Rowcroft’s Inpatient Unit, that that’s where he wanted to be. After a few weeks Jorge’s pain relief became hard to control; too much and he would fall asleep, too little and he would need additional pain relief. Louise suggested seeing if Rowcroft’s Inpatient Unit had a bed, so Jorge could be admitted and his pain and symptoms sorted out. He went in on 21 September 2016 but following a number of chest infections at home, developed pneumonia and died on Friday 23. The care Jorge received on Rowcroft’s Inpatient Unit was also exemplary and, just as we’d experienced at home, wasn’t only for Jorge – but for us as well. Housekeeping staff and volunteers would ask if they could get us anything, and one of the sisters showed me the peaceful room at the hospice for those who have died. I’d asked what would happen to Jorge after he died and really appreciated her talking it through with me. It felt personal and much more personal and caring for Jorge too. My son and daughter-in-law had been on holiday but they came down to see Jorge on the Inpatient Unit on the Thursday, and he must have known they were there. We were offered a drink from the drinks trolley and Miguel, our son, joked that his Dad would want a Bacardi and coke. Jorge smiled, so we knew he could hear us. We went home that night and at 1am received a call from Rowcroft. Carole, Jorge’s Nurse, explained that he wasn’t well, and perhaps we’d like to come in. We went to his bedside and that’s where I stayed until Jorge died. I thank the stars above for Rowcroft and am so grateful Jorge was able to spend his last three days at the hospice – he was peaceful, he had a peaceful death, he wasn’t in distress and I was calm. The nurses made me a chair by his bed while my son and daughter-in-law went to another room, I didn’t sleep, but the whole experience was as good as it could possibly be. After he died we were given as much time as we wanted to say our goodbyes. Following Jorge’s death, Pat visited the hospice to collect Jorge’s belongings and death certificate, and was touched to be met there by Rowcroft Nurse Carole. Pat has since joined Rowcroft’s Bereavement Group, which meets once a month. “I share how I’m feeling, listen to others and pick up on how different we all are,” she explains. Pat has also become a Volunteer in the hospice’s Newton Abbot Furniture Outlet so, if you ever fancy a natter, you’ll find her in there every Thursday, “Rowcroft remains very close to my heart,” she said.